The Paw Patrol TV series has captured kid’s imaginations on both sides of the Atlantic, with Spin Master holding the master toy licence. 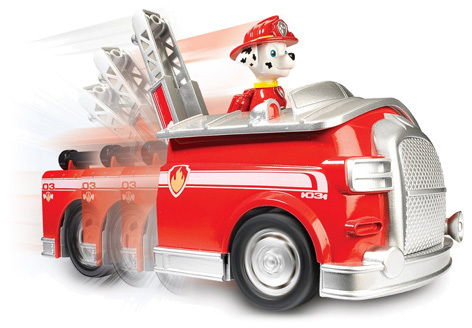 Their hero product known as On-A-Roll Marshall fire fighting vehicle is tremendous play value and is full of working features. It even includes A Marshall figure dressed in all his fireman gear! An extending ladder helps him to rescue anyone trapped in a house fire in Adventure Bay. Marshall is also joined by Ryder’s Rescue ATV, Skye’s High Flyin Copter, Zuma’s Hovercraft and Rubble’s Digg’n Bulldozer. Kids also love to collect all the vinyl Paw Patrol figures and some are even lucky enough to get a Real Talking Rubble Plush figure. It comes ready programmed with woof noises and plenty of other authentic sounds. Please tell us what you think of the On-a-Roll Marshall by Spin Master.